Instead of looking for an alternative to heat-shield, I'd like to draw from analogous naval tactics I heard about; Back in the 1950's to 1960's, or thereabouts, in heavy weather, ships stream (or used to stream) oil over the waters for ease of passage. Would it be possible for a re-entry capsule to use something similar to reduce it's re-entry velocity to relatively manageable levels? Say, nylon/silk threads/sheet after them - sort of like deploying a drogue, or even the chute in thin atmosphere. Pack multiple chutes, and discard each in stages as a function of air-speed, and atmosphere density. What is the maximum re-entry velocity (I know this will vary depending upon the mass & form of the capsule - but say we're talking about Soyuz TMA-M) that would allow heat generated by passage of air to be dissipated without special shielding? 1. About maximum reentry speed, unshielded. "An approximate rule-of-thumb used by heat shield designers for estimating peak shock layer temperature is to assume the air temperature in kelvins to be equal to the entry speed in meters per second." (for vehicle speed see figure below). Then it depends on the spacecraft material exposed to heat. The material must maintain its mechanical properties, and the temperature inside must be acceptable. For current deorbit schedule, the reentry interface occurs at 102.3 km altitude, at 7,591 m/s. How much time will be needed for the compounds to melt at 7,823 °C (or the inside temperature unacceptable)? figures will change when the reentry interface speed will be decreased, and so the landing trajectory. Alexander Bolonkin wrote an article (another version here) in which he proposes to use high-altitude parachutes to supplement or replace the heat shields. Warning: The author looks like controversial. "The widespread production of high temperature fibers and whiskers allows us to design high temperature tolerant parachutes, which may be used by space apparatus of all types for braking in a rarefied planet atmosphere. 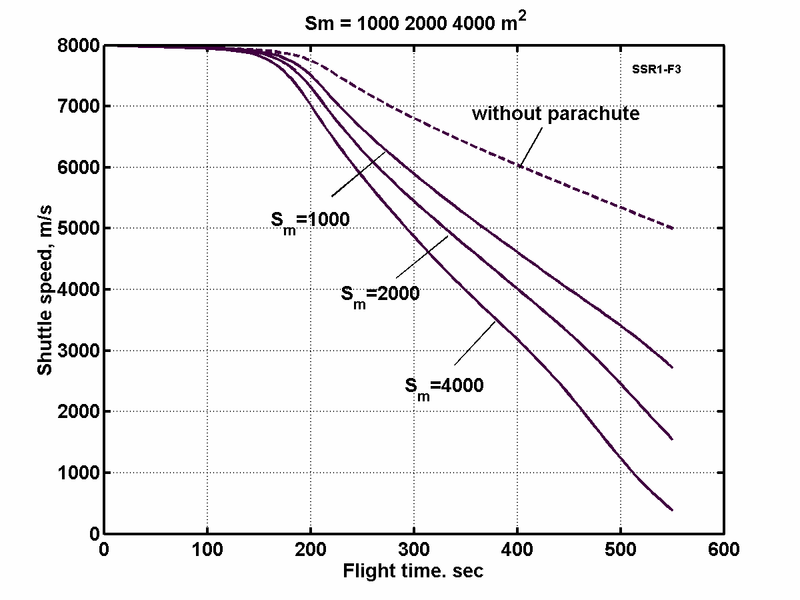 The parachute has open backside surface that rapidly emits the heat radiation to outer space thereby quickly decreasing the parachute temperature. The proposed new method significantly decreases the maximum temperature and heat flow to main space apparatus. That decreases the heat protection mass and increases the useful load of the spacecraft." I don't know if this has been researched further, or even confirmed as valid. Not the answer you're looking for? Browse other questions tagged reentry soyuz-spacecraft heat-shield thermal drag-augmentation or ask your own question. What are reentry speeds of space vehicles? Have liquid cooling systems been tested for reentry surfaces? Do you need a heat shield to enter the atmosphere from non-orbital speeds? What are the major challenges faced in designing a reusable heat shield? What is the maximum velocity for feathered reentry systems? Could a small enough femtosat/chipsat survive reentry without a heat shield?